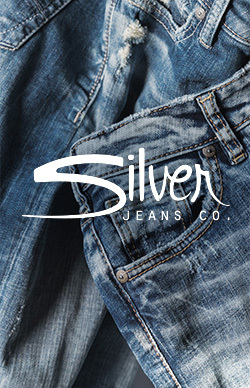 If you’re a guy with classic style and want jeans to match, give Silver Jeans Co.’s men’s straight leg jeans a try. These are the ultimate tried-and-true jeans, designed with a leg that’s not too slim and not too relaxed, but just right. We know every guy is built differently, which is why we offer a variety of fits to choose from in our straight leg jeans category. First up is Nash, designed with a classic fit through the hip and thigh and straight leg that’s always in style. This is a great everyday jean. For the laid-back guy who wants a little more room in the hip and thigh, we have Zac, Grayson and Gordie. Our Zac jeans are designed with a relaxed fit, Grayson with an easy fit and longer saddle and Gordie with a loose fit (our roomiest jean). All are finished with the signature straight leg you’ve been looking for—proof that our men’s jeans truly are #TheGreatestJeans. Beyond fits, our men’s straight leg jeans are offered in an array of fabrics and washes, from durable, classic stretch denim with a distressed light wash to soft, super-stretch denim with a clean dark rinse. So no matter what straight leg jean you’ve been on the hunt for, you’ll find it here, guaranteed.